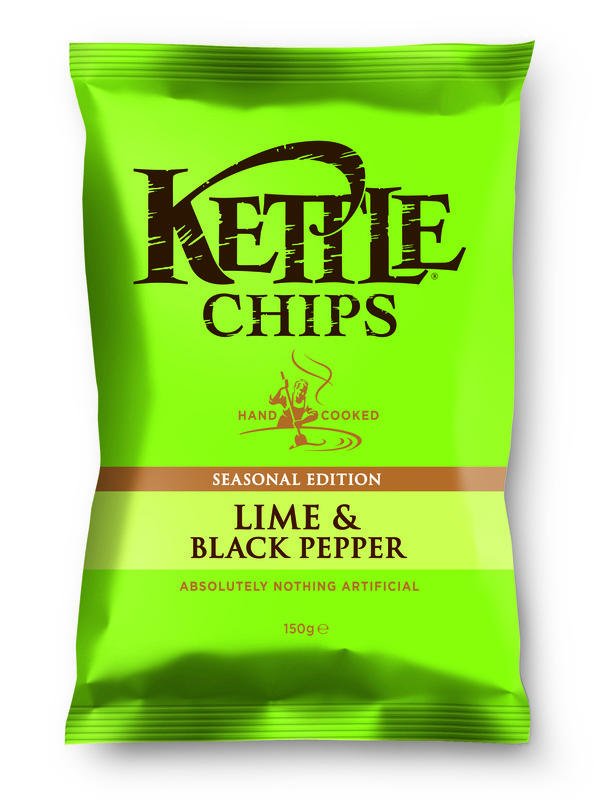 Kettle Chips prove that you don't need loads of fancy colours and flashy graphics to design a great Crisps bag. The orange colour and contrasting brand name and flavour description work perfectly. In many respects, Kettle provide the optimum crunch. It starts off firm and hearty, it deteriorates at a recent rate and the mulch period only emerges at the last knockings. However, to contradict this, this additional thickness denied crispness in this case. These were thickly sliced Crisps, with skin on edges and a plentiful supply of oil boils to break up the mostly pale yellow surfaces. There were also black spots dotted around the Crisps and the interior of the bag. A Nose Plunge Test revealed a stern potato aroma, but this was certainly laced with a hint of Lime. The first flavour we noticed was that hint of Lime. It was not strong but it accompanied the warm potato well. Just as we were about to express disappointment that there appeared to be minimal Pepper, a kernal seemed to explode under the pressure of a full munch. That'll teach us! Overall, the impression was of a missed ingredient - they were nice, the combination even worked well, but what was it that we wanted included?